Today is play day! I bought this large (sorta giant) Zisha clay container a long while back, intended to store water. 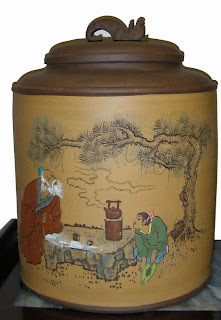 It's a commercial size tea canister as its original usage. 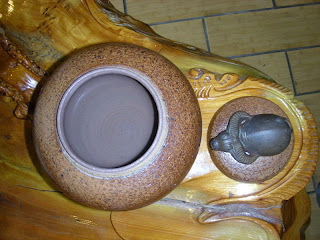 Zisha - purple clay can do numbers to tea, be it dried leaves, water or tea. I had a smaller size container and my friend took it. It was for both presentation and water refinement purpose. The size was perfect for home/personal use, contains 1.5 gallon of water. However it was sold out, so I had to think BIG. Container in the picture holds up to 5 gallons of water, big enough to have a tea party for five. It's been sitting in the store for almost a year, not sure when I'll use it with this much capacity. Today is the first time it ever made it out of the box. I might use it this Sunday if any of you LATA people wants to come by. I just have to remember to look for the bamboo scoop some where in the garage. Love tea toys! I am using this small Yixing jar for personal use. A bit small for my daily consumption of about 1 gallon of tea (during work hours only). It holds about 0.75 gallon of water. So I'll have most of my tea in better water. 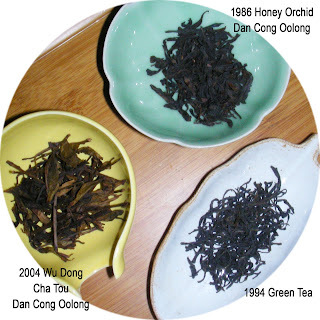 A 5 years old Dan Cong oolong, has a nourishing honey like flavor, comforting to every flesh where it passes through. It has a creamy and nutty taste and texture, reminds me of Cashew and Macadamia Butter on banana. 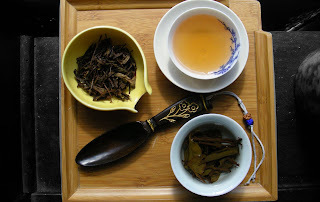 I had a hard time relating Wild Hong Yin to any of the aromatic Dan Cong oolongs previously, one is earthy and strong, the laters are fragrant and subtly euphoric. These older leaves bridge the 2 together, where it connects its ancestry to the off springs. 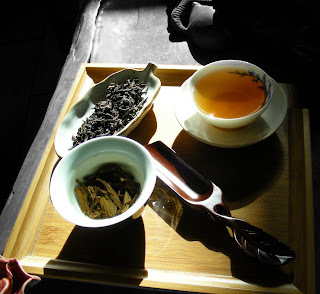 The first couple infusions are obvious Dan Congs, the later infusions unveil the wildness of its ancestors. It's a wild ride! It's been a long time since I have done a tea evaluation tasting with pictures and notes. When you get swamped by many teas at one time, it's overwhelming to conduct such in dept tasting while entertaining clients. A classic sample of well roasted tea using charcoal as a heating source. 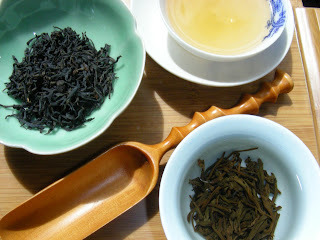 If you are not quite sure what charcoal can do to a tea, this is a profiling tea to have. In order to store and age tea-any tea, the bottom line is low moisture content. If you got that down, any tea can be stored for years. The oldest I have heard and still drinkable (no one died from drinking it) is about 800 years old, buried under the ocean floor for 99.9% of its life time. Believe it or not, it's a powdered green tea brick wrapped in sealed wax paper. The flavor of this aged green tea comes from transformation of substance via roasting and aging. The color is a glowing clear light amber hue. Sweet with black tea like texture, a sweet dates like flavor which present in charcoal roasted teas. You can not detect any green tea shadow in this tea until everything goes down. After taste clearly unveil the crisp unfermented mouth feel of green teas. Since this is green tea, using green tea brewing parameters is essential, although slightly higher temperature (95 c) water can bring out the charcoal flavor more than cooler temperature (87 C). Boiling water is not recommended. Some how the sweetness and flavor are trapped inside of the leaves when using boiling water. Energy comes from many sources, the tangibles and the intangible sources. Food, a tangible source of energy. Tea is also a tangible source. Intangible sources sometimes provide a great deal of energy, more than we realize, yet we live in this pool of energy daily. A simple encouragement can lead to the beginning of great accomplishment, or destruction. A few tender words has the ability to create the most beautiful castle, or destroy a nation more than once. A smile of a lover can get you through a tough day. A giggle from a baby melts the toughest man's heart. We shall gather as much positive energy as we can, soak your mind and soul with all that you can. It's no less important than food, water and air. The key is identifying the positive energy. I find tea to be my tangible source of positive energy. It could be coffee to an other person. I find my nieces and nephew are source of positive energy. Kids could be a burden to others. I find family to be a source of positive energy although there are ups and downs in life. Others can't wait to leave the nest. Recently books I have been reading are Chinese medicine related. It used to intimidate me, fearful of the depth and broad horizon it entails. Chinese medicine is 4 dimensional, covering the tangibles and the intangibles, the physical and the spiritual, organs, limps, mind and philosophy. Symptoms are sickness in eyes of western medicine. Symptoms are ways our body communicates with our mind in Chinese medicine, a warning from mild to irreversible if ignored. We ignore or mistreat them because we do not understand. A liver's way of communication is blurry eyes, hot temper, or aching gums and others. If ignored, it can be fatal. If we can identify the signals, we can treat those symptoms. However what causes live to behave this way? That's the root of the health issue. A 70 years old man has all the above symptoms plus much more. The cause of this, his wife had a major illness 6 years ago, fear of his 40+ years companion will leave him soon caused his psychological depression, in turn caused obstruction of energy flow, led to his liver function digressed for years. It's not a Hollywood romantic story. 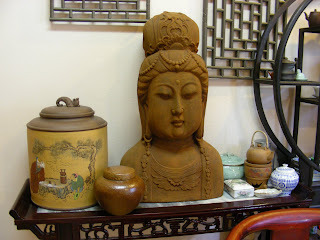 It's a couple of old Chinese man and woman's everyday life, providing vital energy for one and other.